“Ban homework before third grade; support children’s play”. That was the banner headline from an article from The Christian Science Monitor that got quite a few shares recently on Facebook. And a fair amount of exposure through Twitter too. How much learning is happening here? A study done by Sandra Hofferth of the University of Maryland found that from 1981 to 1997, American kids ages six to eight spent 25 percent less time engaged in free play and 18 percent more time in the classroom. Their homework time increased by a shocking 145 percent. Her updated research in 2003 shows play time continuing to decline and study time increasing yet another 32 percent! 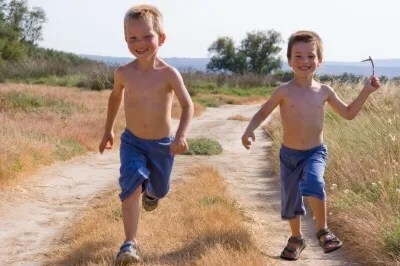 Free play is vital – it’s how children learn resilience, personal competency, social skills, problem solving and a myriad other things that research shows are the best predictors of future academic success. And how much learning is happening here? But homework is destroying children’s opportunities to develop these skills through play. Little wonder that academic results have been declining for years both in the US and here in Australia, where homework is also out of control. Ask any parent – homework can be a living hell for both children and parents. The constant battles to get the work completed (or even started); the tears of frustration when the work is too hard; the utter boredom when it is too easy; the “20 minute assignment” that actually takes 5 times that long for the average child; the excuses for why the work hasn’t been done; the outright lies (“No, I haven’t got any homework today!”). Homework is loathed by children and by most parents – and rightly so. But surely homework is a vital part of a child’s education? Well isn’t it? Surely we wouldn’t be giving out all that homework if it doesn’t improve academic results? NO! The research is overwhelming: homework does NOT improve academic outcomes for children in elementary and middle school. Quite the reverse: the more homework that is given the WORSE the academic outcomes. The strongest correlation found is that homework results in children disliking school. The more homework given – the more children hate school and the less interested they become in learning for its own sake. Now it’s bad enough that schools are giving out homework to young children, but it gets worse: I know of child care centres that give homework to children as young as THREE! And I know of other centres that tell me parents are demanding that their children should be given homework by the child care centres! This is utterly insane! Let me state categorically – I totally agree with both Bonnie Harris and Alfie Kohn. Homework – or at least what we think of when we use that term – is a blight on young children’s lives and it should be banned completely. So why have I called this blog post “A Defence of Homework”? Because some kinds of homework have HUGE benefits for young children. The problem is we’ve been giving the wrong kinds of homework and we’ve been giving it to the wrong people. We’ve been giving ditto sheets and maths problems and “find 20 words that start with the letter T in a magazine”, and similar useless dreck to CHILDREN. Instead we should be giving completely different kinds of homework; homework with value, homework that WORKS. And we should be giving it to parents. Here’s what I mean; these are the sorts of “homework assignments” teachers could be setting for parents. It’s not meant to be an exhaustive list, and not all of them would be suitable for children of every age, but you will get the idea. Teach your children how to safely use simple tools like hammers, saws, hand-drills and pocketknives. If you don’t know how to do this yourself – learn! Consciously show how you use simple math everyday – count out your change at the shop; count the number of apples and oranges you bought, add them together so you show that 5 apples plus 3 oranges mean you have 8 pieces of fruit and they cost X dollars and cents. I promise you, if teachers set homework like that the benefits to the children would be immense. And the benefits would flow on to real academic advancement; children will learn to read better, they will learn to write better, they will learn maths better; they will learn science and the arts and the environment and technology better … every single area of the child’s school work will be enhanced. And the children will be vastly happier – and so will the parents – and so will the teachers. Now, doesn’t that sound better than “Mum, the teacher wants me to do this stuff – and I can’t do it! I just can’t!”? 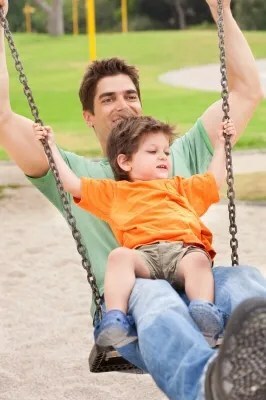 This entry was posted in Education Research, Homework, Outdoor play, Play-based learning and tagged Alfie Kohn, Child development, community, creativity, culture, early childhood education, Education, Homework, Play, school by Alec @ Child's Play Music. Bookmark the permalink. Couldn’t agree more. Bravo! A great list of homework for parents. Thanks – but I really think of this as more than just a list of things that parents should be doing with their children. I’m seriously proposing that teachers should be actively setting activities like these as “parents’ homework” in exactly the same way as they are currently setting “students’ homework”. Probably most parents have been told that they should do some at least of these things with their children – there can be very few parents who don’t know that reading with their children is a good idea, or that playing with their children is important. But many of the things in my list would never occur to many parents, and very few sources are actively promoting them. Sure people like you and me and many other child professionals are well aware that 4 and 5 year olds can learn to use hammers and saws perfectly safely, and that the experience of using real tools is tremendously rewarding and intensely educational for young children. But it’s hardly out there in the mainstream, is it? Many parents (and quite a few teachers) would react with horror to the idea. But if the child’s teacher says to the parent: “your challenge for this week is to do some woodwork with your child – you will need a 2 ounce hammer, 50 2 inch nails, sand paper, scrap pine boards, a tenon saw and some safety goggles. We will supply the equipment if you don’t have them – and here’s the fact sheet and links to YouTube videos and blog posts to show you how to do it properly and safely. Come back next week and tell me how it went.” that would be an entirely different matter. The parents might even enjoy it! And the kids certainly would. And then it could be incorporated directly into the classroom curriculum because the child would be eager to do “show and tell” about being a carpenter for a week, and displaying the stuff she/he had made, and writing it up in class for the “Parents’ Homework Big Book”, and documenting it with digital photos, and researching more about carpentry and tools and materials and … well the possibilities for meaningful learning activities are just endless. I truly believe that this could be made to work – it would not be without difficulties, but what thing that is worth doing is without difficulties? Thank you Alec, I so agree that children should not be given yet MORE desk based paper homework and love your list of ‘work’ that parents and children can do together…..the benefits of these to the whole family is huge! Thanks Niki – I appreciate your support for the concept. I think another thing that this would do is reinforce that it is not teachers alone that are responsible for educating a child. A quality education for a child relies on a three-way partnership between the teacher, the parents and the child. They have differing roles, but each is as important as the other. Quality education relies on mutual support and a common vision. I think this could really help attain that. This is such a fantastic list! And I love that not one of them needs to be done sitting down at a table (except meals of course). When I was teaching I never gave out homework. Parents used to ring me and demand homework. I even had the Principal come and tell me to at least give them ‘some small busy work’ (!) But nope, NO homework!! My friend told me just yesterday that her three (!) year old son is given homework from his weekly music lesson – not practising music but worksheets, cutting out, gluing and colouring! I couldn’t believe it!! Thanks for your comment, Kate – it must have been hard to resist all the pressure to set homework but well done for sticking to your principles. And that is a very sad story – but unfortunately it’s not uncommon. It seems to me that one of the hardest things about convincing people that homework serves no purpose is simply that homework has always traditionally been part of schooling. We were all set homework; our parents and our grandparents all got given homework too. When something has always been done a certain way it’s difficult to persuade people that “it’s traditional” isn’t a good enough reason to continue doing it. I agree completely, the institution of school and the curriculum have become like scripture. Yes, small changes are made within it but essentially the way that it functions is accepted as the way that it is. There needs to be a fundamental shift in our thinking and in our doing for the betterment of our children. Like you said, why is it done this way? Do we do it this way just because that is the way it has always been done? Why are classes grouped by age, why do they study these subjects and in this way? Who says they need to be in the classroom to learn? Why is the teacher the keeper of the knowledge? A fundamental shift. I definitely think that there is a slow grass-roots movement towards play/project/student-directed learning but it seems to be largely in the early years where it is accepted that children play. I taught high school and saw a lot of resistance. Play was for children, adolescents studied, hard, from books and teachers. I think it will be a long time before adolescents are truly able to learn through their own pursuits, through play, exploration, investigation, in the real world. It’s not just the teachers and the schools but more importantly the parents and society and their view of what school is and how it works. But we’ll keep fighting the good fight because like you know, it is so very important. Thanks for your comment, Rob. I know it’s counter-intuitive, but that’s what the research says: homework doesn’t seem to improve academic results in either elementary or middle school and has only very modest benefits for senior school students. 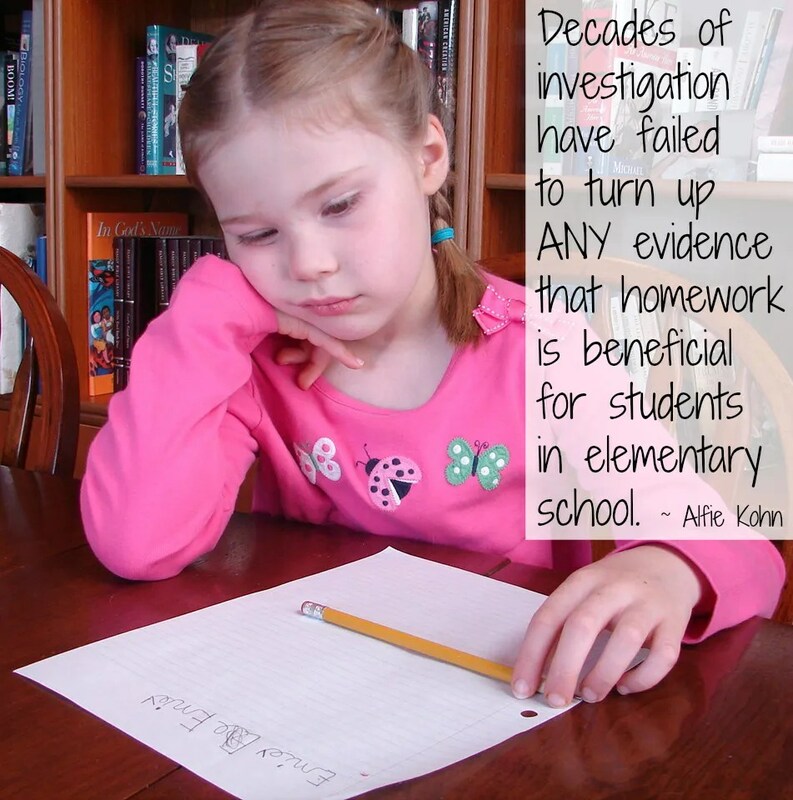 Check the links I’ve provided to Alfie Kohn’s work for more information on this. If you can provide links to research that contradicts this I would be very interested to see them. I agree that children need lots of opportunities for practice of skills, not just in maths but in all subjects. But the place for this practice is in the classroom, isn’t it? In a classroom the student has instant access to a teacher for feedback about her/his work; if they have difficulty with a concept they can be set straight by the teacher, or by fellow students. But a student who gets it wrong in homework may not find out for days that they are in error since they have to do the homework, hand it in the next day and then wait to have it returned to them once it has been marked by the teacher. And by then they will have learnt the mistake, they will have practised the mistake over and over again. And unlearning is hard. This may be one reason why homework is so ineffective. Also, think of the many valuable things they could be doing and learning during the time that is wasted doing homework, and the way that homework reduces children’s pleasure in learning and school (that’s the strongest correlation for homework: the more homework that is given, the more children hate school). I want children to love learning and school, and I also want children to have time for themselves and for their own self-directed learning.